Salted egg paste just makes everything taste better. 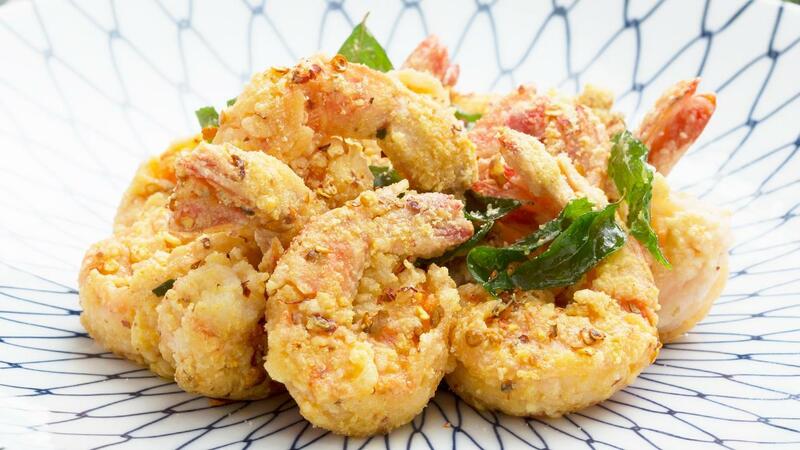 Serve up the ultimate prawn dish with this recipe! Indulge in an irresistible blend of flavours and textures and understand why salted egg and prawns is a match made in heaven. To make the sprinkle, combine all ingredients for the mixture in a bowl. Heat oil in a wok until it reaches 340 degrees Fahrenheit. When the shrimp is almost cooked through, add the curry leaves the hot oil, to let the leaves crisp up along with the shrimp finishes to cook. Strain immediately when cooked and place in a stainless bowl. Combine the Knorr Salted Egg Powder Sprinkle mixture and toss until all the fried shrimps are coated.